The Bob Moog Foundation is thrilled and honored to announce the launch of its annual raffle for an iconic, highly coveted vintage Minimoog® Model D synthesizer. This year’s prize has been signed by the legendary Stevie Wonder, whose career has helped shape popular music and inspired people worldwide. Stevie pioneered the use of synthesizers integrated seamlessly with acoustic sounds, which influenced the development of electronic music. Watch here as Asheville-based Thomson Knoles of the band STIG explores the depth and sonic fun that makes the Minimoog so epic and iconic. WATCH HERE as Asheville funk keyboardist Thomson Knoles explores the sound of the Minimoog signed by Stevie! The phenomenal Stevie Wonder, American singer, songwriter, musician, producer, is one of the most celebrated and prominent figures in popular music who, at 12 was the youngest recording artist to simultaneously reach #1 on Billboard’s Hot 100, R&B Singles and Album Charts with “Fingertips, Part 2.” He has released a striking array of innovative music including 32 #1 singles, and has won 25 Grammy Awards a Golden Globe and an Oscar. He is the youngest recipient of the Kennedy Center Honors and was awarded the Library of Congress Gershwin Prize for Popular Song. Wonder has demonstrated extraordinary humanitarian and philanthropic leadership including spearheading the realization of “Martin Luther King Day” as a national holiday and working to end apartheid in South Africa. Stevie has received the Presidential Medal of Freedom, and he is a designated U.N. Messenger of Peace with special focus on persons with disabilities. He continues to be a pivotal influence in U.S. and world events, demonstrating the activism that has made him such a vital voice for social progress and world harmony. The Minimoog Model D is widely regarded as the most iconic synthesizer of all time and was recognized as such in a 2006 international voters’ poll by SonicState.com. 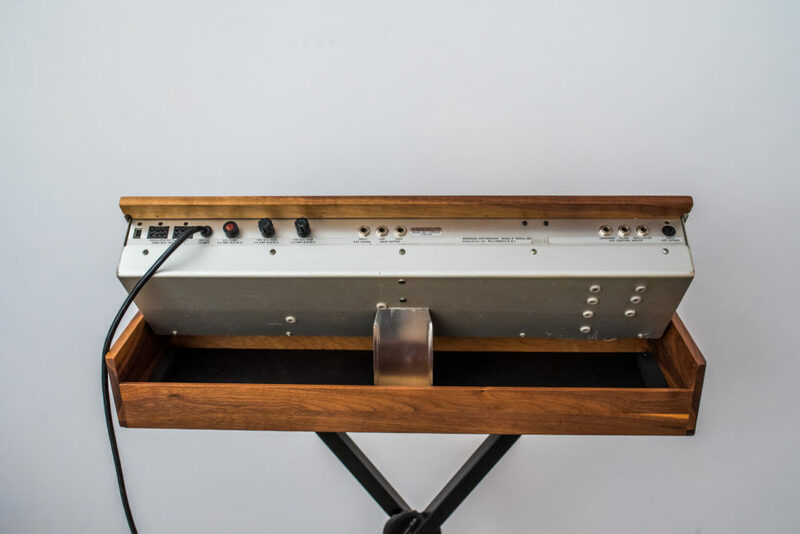 When released in 1970, the Minimoog represented a musical and technological revolution, with its combination of portability, affordability, accessible user interface, and innovative sound and functions. Its robust construction has allowed the instrument to withstand the test of time. 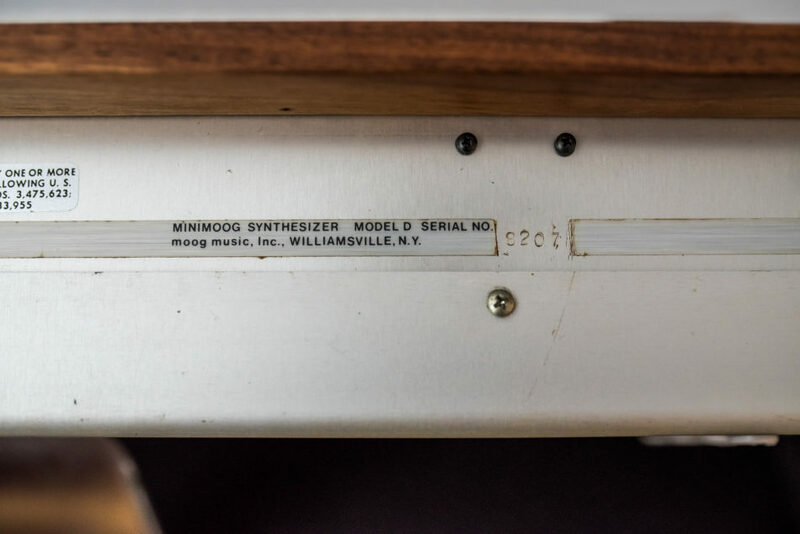 Vintage Minimoog Model Ds are coveted by synthesizer enthusiasts worldwide and regularly sell on eBay and other auction sites for $4,000-$10,000. The Bob Moog Foundationis a 501 (c)(3) non-profit organization founded upon Moog’s passing in 2005 to carry his legacy forward to future generations. The Foundation’s mission is to ignite creativity through the intersection of science, music, and innovation. Its projects include Dr. Bob’s SoundSchool, a 10-week innovative curriculum that teaches children about the science of sound through music and technology, the preservation of the Bob Moog Foundation Archives, through which the organization protects and shares over 10,000 historical artifacts with museums, researchers and enthusiasts, and the Moogseum, a facility that will serve to celebrate the history of Bob Moog’s legacy and explore the science and art behind sound and synthesis. The Moogseum will open in late spring 2019. Years of endless music from gurú Stevie Wonder a master in mixing and musical ideas. Mr. Stevie Wonder is all inspiration and school of great creativity. I wish I kept mine as a kid, thrift shop find, had no idea I would have a need for it today with my music. These are absolutely my favorite synths , especially for bass. Stevie Wonder and the Mini Moog are amazing! The first time I saw and operated a Mini Moog was in 9th grade in 1971/72. The school (Benjamin Franklin Junior High School in Ridgewood, NJ) was fortunate to be able to acquire a Mini Moog for student use in their Musical Productions program, which I participated in. I was “tech support” for this exciting new technology (the electronics geek that I was/am), and it is certainly my dream to be able to operate one once again! It would be SO cool to have that go to someone who could really use it! I used to repair these back in my college days, a great instrument. What an iconic artist and instrument!! What a sweeps! 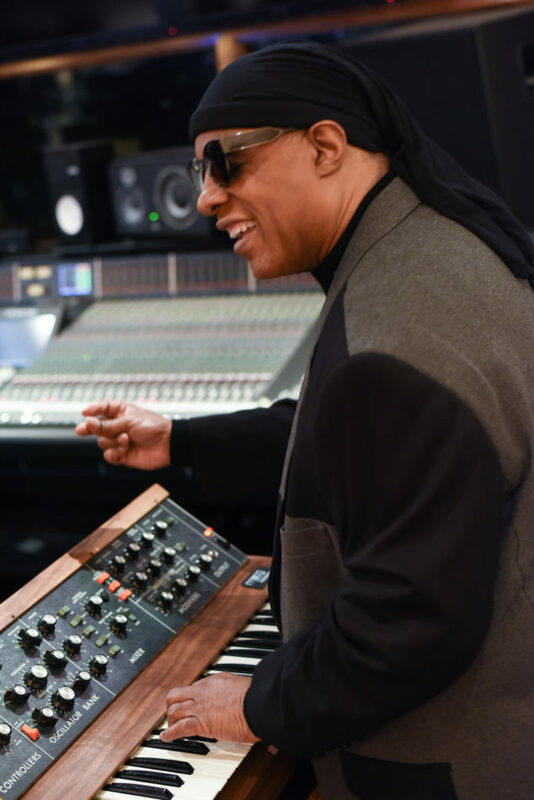 I would be in heaven playing a vintage Moog signed by living legend Stevie Wonder. Always dreamed of owning ANY moog! 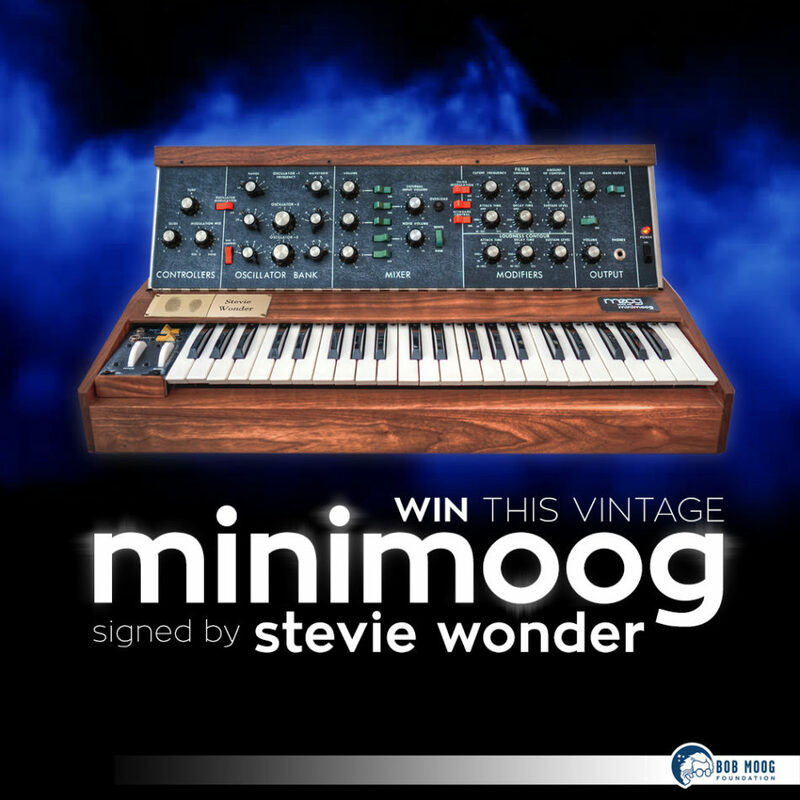 Whoever wins this MiniMoog is going to be one happy person! I’ve been in several bands that had this synth and it’s a one of a kind sound, especially for that 70’s era rock! Love it! I am a Fusion musician and composer so I really need that Mini Moog look me up on Google the ,” Aaron Olshan Solo Project and listen my Email address is Aaronartist@gmx . Look me up in Reverberation and Soundcloud. What a great instrument, every keyboard player should have one….. I Will Forever Love Stevie Wonder, His Music And The Minimoog & Memorymoog! Have Owned Both & Definitely Wish I Still Owned Them! Love the moog, on the George Harrison Wonderwall Album …..
Keys were the first instrument I started on….I’m a collector of as many instruments as I can get ahold of…all played.